"Look for the AIPAC hand whenever the US gets embroiled in a foreign policy debacle. Zionist agents will engender conflict and continue riding the American wagon -- as it rode the German and the British before -- until the US becomes useless. Then they will jump on the next world power wagon." Kosher Theft. Jamal Kanj, http://www.palestinechronicle.com, March 26, 2014. [Obama's] ideas were stirring. Time and again the president invoked democracy, self-determination, human equality, territorial integrity and dignity -- principles the U.S. has nullified in its policy in Israel and Palestine. Obama's European message -- self-determination, equality, dignity -- is null and void in Palestine. Philip Weiss, http://www.opednews.com, March 29, 2014. It was a different world two decades ago. The Soviet Union under Yeltsin's hand capitulated to the west and the slow march away from a democratizing state began. The west had "won' the Cold War and had it within its range to make a global "peace dividend' with promises to not extend NATO into eastern Europe. The U.S. economy, although already on the path to serious economic debt problems, had worked side by side with China for a new era of global prosperity, at the same time that the economic tide in Russia was all about asset stripping and the rise of the oligarchs. 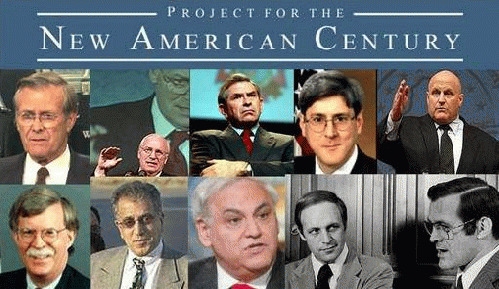 One group had it mind to determine what kind of peace it was to be, the participants in the Project for a New American Century, headed by William Kristol and Robert Kagan. Among their many stated ideas was the concept of "full spectrum dominance" within which Richard Perle and Paul Wolfowitz were advocating for "first strike winnable nuclear war." There were to be no new rivals to U.S. dominance on land, sea, air, or space and U.S. economic and political dominance of the world was assured. This process, "even if it brings revolutionary change, is likely to be a long one, absent some catastrophic and catalyzing event----like a new Pearl Harbor." This group already had its sights on Iraq and provided much support for their Israeli partners in the Middle East. Plans that were ready, and processes that were moving slowly, immediately went into fast forward after the 2001, 9/11 events. Regardless of its initiation, 9/11 created the impetus and propaganda necessary for a new generation of militaristic actions around the world operating under the general rubric of the "War on Terror." It launched an era of surveillance and authoritarian laws that have greatly diminished the democracy status of the U.S. and its allies. Financially, it marked the beginning of an era in which global finances became dangerously debt ridden as the costs of the wars added to the consumptive debt of a highly leveraged global economic system. Israel rode on these ideas, strengthening its image as "victim' surrounded by a sea of terrorists intent on destroying it, regardless of its own military predominance, its hundred or so deliverable nuclear warheads, and its continuing unqualified financial and military/surveillance/security support from the U.S. and its allies. The "peace process' amounted to nothing more than a lot of delaying talks while more and more settlements were built on more and more Palestinian land. This outpost of western democracy held against the aggressive hordes of Muslim fanatics. Global peace was not at hand, and the "long war' settled into the normalcy of daily propaganda, biased mainstream newscasts, and the supposed ever increasing wealth of the western nations. Democracy and freedom were exported from the barrels of many guns and rocket launchers. For the PNAC supporters, something different happened along the way. In spite of its military hardware, the U.S./NATO alliance stalled in Afghanistan and Iraq. Its "victories' as with Yugoslavia and Libya came at the end of long and severely damaging aerial bombings, leaving behind broken promises, broken people, and broken cultures. The poor financial status of the western countries became increasingly more evident, reaching its apogee with the 2008 economic collapse that threatened all major U.S. and EU financial corporations. The save was made from the power of the petro-dollar, the world's reserve currency, which was printed up in the many trillions of dollars by the US Federal Reserve system in order to bail out the essentially bankrupt banks and financial institutions upon which the U.S./EU economy depended (at least for the powers that be).